While Ed Sheeran battles it out for the Christmas number one, fusion scientists have their own charts of exciting results, the Nuclear Fusion journal’s ‘most read’ papers chart. This year the chart topper comes from UK private company, Tokamak Energy, that unveiled ‘ST40’ its prototype fusion power reactor earlier this year. This will be the third year in a row when the Oxfordshire based company has been top of the ‘Nuclear Fusion Journal’s most read list. The journal is the acknowledged world-leading journal specialising in fusion energy, covering all aspects of research, relevant to controlled thermonuclear fusion. The research papers that are grabbing the attention of the scientific community are based on challenging the conventional view that Tokamaks need to be large in size to produce high energy gain and outline a faster way to the holy grail of fusion energy. 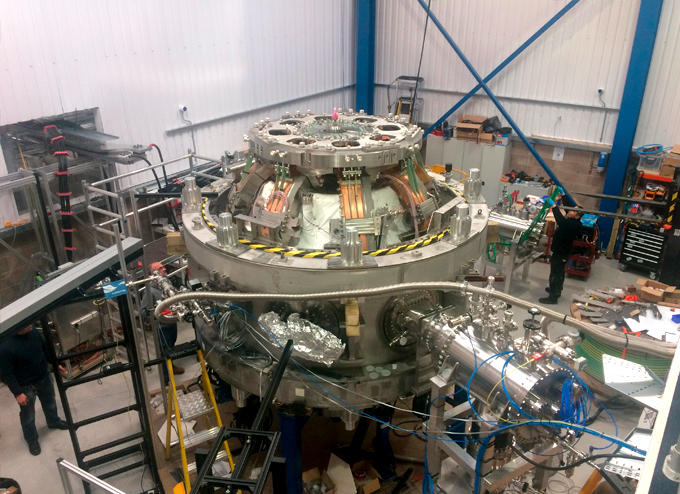 Numerous private companies have tried to make progress in the past, but none – until Tokamak Energy – has produced the solid scientific evidence that has held the attention of the scientific community. The work is controversial, but it is taking the normally quiet scientific world of fusion research by storm. The company is currently making preparations to achieve conditions hotter than the centre of the sun in its current device and in March next year will take part in a special meeting at the Royal Society, where industry leaders will debate whether there is a way to accelerate the development of fusion energy using tokamaks. “A faster way to fusion is possible, and our peer-reviewed and published research lays the foundation to achieve this.